Interior defenders, specifically those capable of rushing the passer, are always hot commodities in the NFL Draft. Waiting until seventh overall (DeForest Buckner) for the first defensive tackle off the board in 2016 was an anomaly. There are plenty of special talents in this year’s crop. Jonathan Allen, Malik McDowell, Solomon Thomas, and DeMarcus Walker highlight the versatility of the group. Each could legitimately be classified as an edge defender, despite also wrecking passing games from the interior. Although there is a shortage of pass-rush depth, a team in need of a nose tackle will have an abundance of options to choose from. Here are the top defensive tackles in the 2017 class. Allen’s game film separates him even among this strong defensive tackle crop. Equally comfortable battling double-teams or running the arc off the edge, Allen is the kind of defensive lineman coaches dream of. He displays classic stack-and-shed technique on the interior, using his length and range to eliminate runs into either of his two gaps. Coupled with explosion off the ball and athleticism to work in space, Allen displays a complete skill-set on a consistent basis. Only news of arthritis in both shoulders is likely to facilitate a wait on draft day. McDowell is somewhat polarizing as a prospect. In conjunction with having to address some off-field concerns, McDowell does not always appear ideally suited to a position on the interior. His desire to mix it up with multiple blockers against power running schemes appears minimal at best; his skill-set is pure finesse. Players with McDowell’s athleticism, however — capable of shutting down plays deep into the backfield — are always in high demand. Additionally, he possesses the kind of refinement essential to succeeding in the NFL, displaying excellent hand placement and a fully stocked pass-rush repertoire. McDowell’s capacity for collapsing the pocket will likely see him selected on Day 1. Brantley’s college production, or lack thereof, was based predominantly on limited exposure rather than quality. In his first three years at Florida, he managed just over 1,100 snaps, never seeing more than 48.3 percent of reps in any season. Like the other members of the top three, Brantley’s skill-set is ideal for the modern NFL. His quick hands and rapid first step ensure that linemen consistently fail to tie him up effectively. Brantley is a zone scheme’s kryptonite; his fast-twitch style makes executing reach blocks nearly impossible. Although he failed to register a high volume of QB pressures (only 29 total as a junior), Brantley amassed that total on just over 190 snaps. Even in a rotational role as a rookie, he could dramatically improve any defensive line. While he ranks highly at his position based on on-the-field production, his recent battery charge is likely to significantly hurt his draft stock. Tomlinson’s versatility bears little resemblance to Allen’s. You won’t find him lined up in a two-point stance anytime soon. He’s more of a traditional defensive tackle, using his strength to clog interior running lanes. Like all Alabama defensive line products, he understands and executes two-gap technique with a minimum of fuss. It would be easy, therefore, to pigeon-hole Tomlinson as just another Crimson Tide run defender. That would do him a disservice. Clearly his wide base and thick thighs form the foundation of his success, but he is more than just a two-down option. Tomlinson possesses the agility to consistently impact the passing game, particularly with his favored arm-over move. He is further along in his development than former teammate A’Shawn Robinson, a second-round pick in 2016, and could probably play any of the interior positions, including nose tackle. Tomlinson is less flashy than his peers, but might just end up a more effective pro. The first nose tackle to crack the list, Taylor’s intriguing potential will likely see him selected some time on Day 2. Although far from perfect, his flashes of brilliance are hard to ignore. Taylor ticks the boxes for size, athleticism and production. His length is instantly noticeable, particularly on first contact. Centers have a difficult job at the best of times, and Taylor compounds the problem with his capacity to overwhelm blockers heads up. If there is one weakness, he might be overly reliant on dominating early in reps. He does not always win his duels if the first contact is neutral, and he can be vulnerable to chips from a second blocker as well as genuine double-teams. Those concerns are mitigated somewhat by the dual-threat he represents. Taylor moves extremely well for a man his size, helping him generate pressure with finesse as well as power. He is a potential Day 1 starter. At 6-foot-5 and 298 pounds, Wormley is an ideal fit at 5-tech for 3-4 defenses, but can also offer versatility working both inside and out outside for a 4-3 team. He was extremely productive against both the run and pass his last two years at Michigan, totaling 84 QB pressures and 54 total defensive stops, with just four missed tackles in that span. Although shorter than ideal at just a shade over 6 feet tall, Smart monopolizes that advantage in leverage consistently. Sufficient length offsets his height deficiency significantly. A low center of gravity and powerful arms combine to facilitate probably the best bull-rush in the class. It is a joy to watch Smart tossing and toying with lineman who are helplessly hoping to re-anchor against the tide that is the former Green Wave product. Attempts to blow him off the ball in the ground game are also fruitless. In fact, Smart is much more likely to win his battles against the run. He flashed astounding ability to change direction in the backfield, consistently regaining his balance to fly to the football and generate tackles for loss. Smart could stand to improve as a tackler, but he represents one of the more consistently disruptive interior defenders in the class. Adams might lack the requisite strength and power in his base to play nose tackle (his role at Auburn), but he might benefit from playing in a position and scheme that allows him to fire off the ball more regularly. His inconsistency is infuriating at times, because he has a highlight reel capable of making evaluators bang the table for his selection. LSU’s Ethan Pocic, arguably the draft’s top center prospect, was decimated by Adams. His instincts also work in his favor, but, realistically, he’ll likely need some time in the weight room before he can be trusted in the base package. On form and on the field, Vanderdoes has elite potential. The issue is that he rarely demonstrated that kind of ability for any prolonged stretch in his final two years with the Bruins. An ACL injury was unavoidable, but Vanderdoes failed to illustrate a full recovery in 2016. Both his mass and motivation have been questioned in the offseason process. Optimists will suggest he was merely working his way back after missing time, and displayed sufficient star quality to be a steal on Day 2. Pessimists will look at some genuinely concerning reps against double-teams, a failure to display his athletic measurables on the field, and a mauling at the hands of Utah’s Garett Bolles as indicative of major flaws. Vanderdoes’ stock and status are hard to pin down. Qualls has good quickness off the ball and moved around the formation to pick up four sacks, two QB hits, and 29 hurries on 324 rushes in 2016. His short arms are less than ideal, as he’ll get engulfed at the line of scrimmage, but his quick hands allowed him to grade at a solid 84.3 in the run game last season. 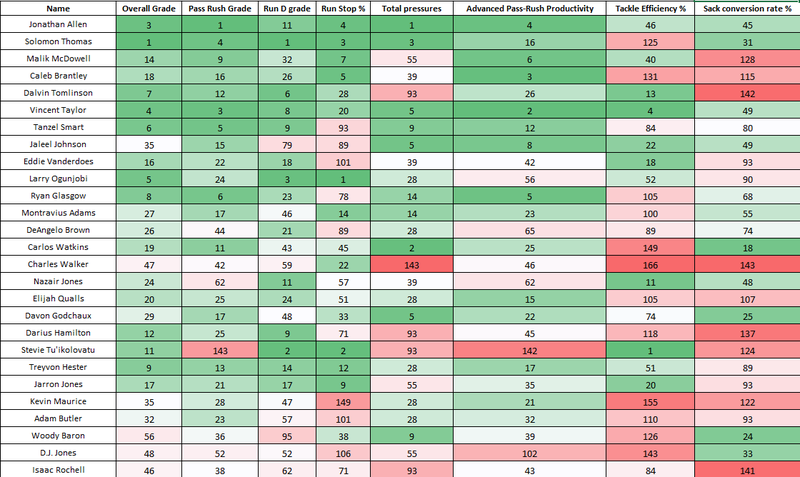 Grade-wise, Johnson does not stand out, but his dependability is a feature of all quality interior defensive linemen. He is one of the best in the class at avoiding negative plays, even if he is also one of the least likely to make a play in the backfield. For some schemes, a run defender who consistently holds his ground and plays his gap, despite occasional double-teams, will be ideal. In contrast, Johnson can be relied upon to make splash plays as a pass-rusher. He fires off the ball, and then reaches into a bag of moves so varied it is the envy of the class. Once Johnson reaches full speed, he can deliver the full force of his frame, demolishing centers on stunts, in particular. A disappointing workout might see him fall, but the focus should instead be on his game-defining performance against Michigan. Glasgow is a rare prospect capable of aligning almost anywhere on the defensive front. He played nose tackle at Michigan, but could plausibly have played the three had Jim Harbaugh not built a defensive line rotation filled with NFL-level talent. Glasgow illustrated an adaptable skill-set with the tools to succeed at the next level. A player with few weaknesses, he combined a stout anchor with surprising quickness to make plays throughout his college career. Glasgow also stands out because of his instincts; he rapidly diagnoses run and misdirection concepts. The mid-rounds of 2017 will be an absolute goldmine for teams searching for a base package nose tackle. Ogunjobi might be the best of the bunch. He likely won’t last until Day 3 after solid Senior Bowl and combine performances boosted his stock. Ogunjobi established his reputation prior to the offseason circuit, wrecking Conference USA with his strength on the interior. He may not have been facing elite competition, but the Charlotte product stood up to double-teams consistently in his final two years of college. Ogunjobi was ridiculously productive against the run, generating 77 stops in 2015 and 2016 combined. Although clearly superior on early downs, he’s also a competent power rusher, suggesting Ogunjobi has potential to contribute even in the nickel. A surprise Senior Bowl and combine omission, Brown could legitimately start in a base package as a rookie. He is one of the best prospects in this class against double-teams. Brown displays tremendous technique against multiple blockers, sinking his powerful lower body to deny lineman vertical movement. Even when initially unbalanced, he displays a consistent capacity to re-anchor and earn a draw at worst. Admittedly, Brown is unlikely to emerge as a nickel pass-rusher, yet a mid-round investment is almost certainly worthwhile for a valuable member of any defensive line rotation. Clemson produced three prospects capable of contributing on NFL rosters in 2015. The fourth member of that starting front will follow suit this season. Watkins is more solid than spectacular, especially for a three-technique, but his versatile skill-set will appeal to the majority of pro teams. He’s a player built on length and strength, working through blocks, rather than around them, to make plays. While Watkins rarely embarrassed offensive lineman as a pass-rusher, he restricted the pocket frequently enough to represent a threat to opposing quarterbacks. Containing some of the athletes at the position in the NFL can be simplified significantly by Watkins’ deployment. He may have been overshadowed at times by Clemson’s freakish athletes, but Watkins is a fine player in his own right. Jones entered 2016 on multiple early-round watch lists. A player with his frame and explosion should be in the conversation on Day 1. Instead, Day 3 looks more likely after an indifferent junior year. A position change as a sophomore might have held him back. Jones enjoyed his most productive season as a pass-rusher, playing five-technique as a freshman. Although he made some plays in 2016, the majority of his pressures were achieved through power moves rather than quick sheds and subsequent quarterback hits. There are other positives, including four batted passes in each of his college seasons, but Jones must develop further to reach his prodigious potential. A classic, run-stuffing nose tackle, Tu’ikolavatu ranked second in the draft class in run-stop percentage (12.6) and had a strong week in the trenches at the Senior Bowl. He picked up only 13 QB pressures on 326 rushes last season; that will never be his game, but Tu’ikolovatu has value as an early-down run stopper at the next level. At 325 pounds, Myers is rarely moved off the ball, and he has a good feel in the run game, allowing him to rank 12th in the draft class in run-stop percentage, at 10.1 percent. He has little chance of creating pressure, as he notched only three QB pressures on 313 rushes in 2016, but Myers can hold the point and play the run on early downs at nose tackle. Although he fails to stand out in any area, Bryant’s complete skill-set makes him an attractive proposition in the mid to late rounds. He generated 63 combined QB pressures in 2016 to go with 23 stops. Jones can play rotational snaps on the interior of a defensive line; he recorded 18 run stops in 2015 and 13 in 2016. If Jones can generate a more consistent pass-rush, he could possibly push for a starting role down the line. Allen is a naturally-gifted pass-rusher capable of beating multiple blockers in one pass-rush sequence to get to the quarterback. Whether aligned over the nose, in a gap, or on the edge, Allen isn’t likely to be delayed long on his way into the backfield. Every good rush sequence, whether power or finesse, starts with an explosive first step. Smart then effectively converts speed to power using excellent leverage and heavy hands. He doesn’t dwell on his initial success, using his lower body to drive blockers ruthlessly into their quarterback. The capacity to sustain a high level of performance along various alignments is far from easy. Only players like Tomlinson, with an elite range of skills, can be trusted. Ideally, Tomlinson would play in a varied defensive scheme, where he can provide his coordinator with a large degree of flexibility. Ogunjobi is at his best going downhill rather than horizontally. He shrugs off attempts to combo block him with nonchalance, controlling each lineman with one arm apiece. On the frontside of power, he displays the instincts and anchor to reject attempted down blocks, limiting the offensive play sheet. Knowing the snap count is of little help to linemen at a shade disadvantage attempting to zone block Brantley. Really, even a shade advantage is of little benefit, such is his quickness. Getting into the backfield is an achievement, but the Florida product also possesses the range to subsequently finish.